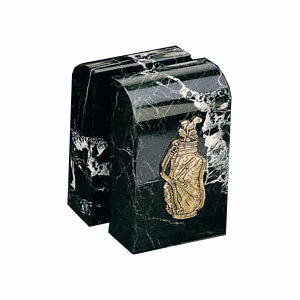 Bring class and charm to your desk or office area with these solid marble bookends with solid brass golf accents. Measuring 6.25 inches H. A great item for any golf enthusiast. Marble pattern may vary. Ships in 5-7 business days. Bring class and charm to your desk or office area with these solid marble bookends with solid brass golf accents. Measuring 6.25 inches H. A great item for any golf enthusiast. Marble pattern may vary.